• At 8:15 AM, The ADP Employment Report for October. This report is for private payrolls only (no government). The consensus is for 210,000 payroll jobs added in October, up from 135,000 added in September. • At 10:00 AM, ISM Manufacturing Index for October. The consensus is for the ISM to be at 59.5, down from 60.8 in September. The PMI was at 60.8% in September, the employment index was at 60.3%, and the new orders index was at 64.6%. • Also at 10:00 AM, Construction Spending for September. The consensus is for a 0.1% increase in construction spending. • All Day, Light vehicle sales for October. The consensus is for light vehicle sales to be 17.5 million SAAR in October, down from 18.6 million in September (Seasonally Adjusted Annual Rate). • At 2:00 PM, FOMC Meeting Announcement. The FOMC is expected to announce no change to policy at this meeting. The Case-Shiller house price indexes for August were released this morning. 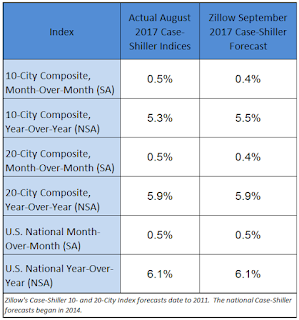 Zillow forecasts Case-Shiller a month early, and I like to check the Zillow forecasts since they have been pretty close. The U.S. housing market has settled into a predictable rhythm that shows very few signs of changing. There is incredibly strong demand, driven by a largely healthy overall economy and aging millennials entering their home buying prime, and there is too-low inventory, driven by limited home building activity. Together, those two factors continue to push housing prices up. 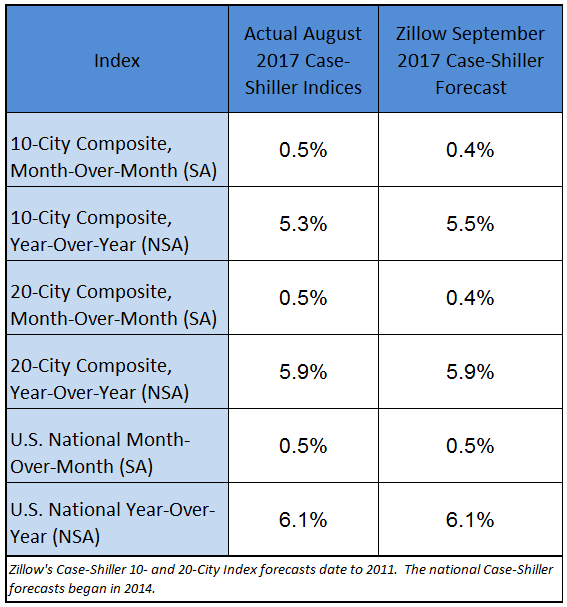 Our home-price forecast for September, which Case-Shiller will not release until Nov. 28, is for more of the same: We expect the national index to maintain its 0.5 percent month-over-month trend, with both city composites climbing 0.4 percent month-over-month, which is slightly slower than they have been. The year-over-year change for the Case-Shiller National index will be about the same in September as in August. It has been more than ten years since the bubble peak. In the Case-Shiller release this morning, the seasonally adjusted National Index (SA), was reported as being 4.3% above the previous bubble peak. However, in real terms, the National index (SA) is still about 13.3% below the bubble peak (and historically there has been an upward slope to real house prices). The year-over-year increase in prices is mostly moving sideways now around 5% to 6%. In August, the index was up 6.1% YoY. Usually people graph nominal house prices, but it is also important to look at prices in real terms (inflation adjusted). Case-Shiller and others report nominal house prices. As an example, if a house price was $200,000 in January 2000, the price would be close to $278,000 today adjusted for inflation (39%). That is why the second graph below is important - this shows "real" prices (adjusted for inflation). In nominal terms, the Case-Shiller National index (SA) is at a new peak, and the Case-Shiller Composite 20 Index (SA) is back to November 2005 levels. In real terms, the National index is back to August 2004 levels, and the Composite 20 index is back to March 2004. In real terms, house prices are back to mid 2004 levels. On a price-to-rent basis, the Case-Shiller National index is back to November 2003 levels, and the Composite 20 index is back to September 2003 levels. In real terms, prices are back to mid 2004 levels, and the price-to-rent ratio is back to 2003 - and the price-to-rent ratio has been increasing slowly. The Census Bureau released the Residential Vacancies and Homeownership report for Q3 2017. The Red dots are the decennial Census homeownership rates for April 1st 1990, 2000 and 2010. The HVS homeownership rate increased to 63.9% in Q3, from 63.7% in Q2. The HVS homeowner vacancy increased to 1.6% in Q3. The rental vacancy rate increased to 7.5% in Q3. S&P/Case-Shiller released the monthly Home Price Indices for August ("August" is a 3 month average of June, July and August prices). The S&P CoreLogic Case-Shiller U.S. National Home Price NSA Index, covering all nine U.S. census divisions, reported a 6.1% annual gain in August, up from 5.9% in the previous month. The 10-City Composite annual increase came in at 5.3%, up from 5.2% the previous month. The 20-City Composite posted a 5.9% year-over-year gain, up from 5.8% the previous month. Seattle, Las Vegas, and San Diego reported the highest year-over-year gains among the 20 cities. In August, Seattle led the way with a 13.2% year-over-year price increase, followed by Las Vegas with an 8.6% increase, and San Diego with a 7.8% increase. Nine cities reported greater price increases in the year ending August 2017 versus the year ending July 2017. Before seasonal adjustment, the National Index posted a month-over-month gain of 0.5% in August. The 10-City and 20-City Composites reported increases of 0.5% and 0.4% respectively. After seasonal adjustment, the National Index recorded a 0.5% month-over-month increase in August. The 10-City Composite and 20-City Composite both posted 0.5% month-over-month increases. Nineteen of 20 cities reported increases in August both before and after seasonal adjustment. “Home price increases appear to be unstoppable,” says David M. Blitzer, Managing Director and Chairman of the Index Committee at S&P Dow Jones Indices. “August saw the National Index annual rate tick up to 6.1%; all 20 cities followed in the report were up year-over-year while one, Atlanta, saw the seasonally adjusted monthly number slip 0.2%. Most prices across the rest of the economy are barely moving compared to housing. Over the last year the consumer price index rose 2.2%, driven largely by energy costs. Aside from oil, the only other major item with price gains close to housing was hospital services, which were up 4.6%. Wages climbed 3.6% in the year to August. The Composite 10 index is off 5.8% from the peak, and up 0.5% in August (SA). The Composite 20 index is off 3.1% from the peak, and up 0.4% (SA) in August. The National index is 4.3% above the bubble peak (SA), and up 0.5% (SA) in August. The National index is up 41.0% from the post-bubble low set in December 2011 (SA). The Composite 10 SA is up 5.4% compared to August 2016. The Composite 20 SA is up 6.0% year-over-year. The National index SA is up 6.1% year-over-year. Note: According to the data, prices increased in 19 of 20 cities month-over-month seasonally adjusted. Are house prices a new bubble? On Friday, I posted five economic questions I'm frequently asked. I'll post some thoughts on each of these topics over the next couple of weeks. A common question is: Are house prices in a new bubble? My short answer was: No. Here is an explanation. I have taken to calling the housing market a "bubble". But how do I define a bubble? A bubble requires both overvaluation based on fundamentals and speculation. It is natural to focus on an asset’s fundamental value, but the real key for detecting a bubble is speculation - the topic of this post. Speculation tends to chase appreciating assets, and then speculation begets more speculation, until finally, for some reason that will become obvious to all in hindsight, the "bubble" bursts. The U.S. Census Bureau announced today that real median household income increased by 3.2 percent between 2015 and 2016 ... Median household income in the United States in 2016 was $59,039, an increase in real terms of 3.2 percent from the 2015 median income of $57,230. This is the second consecutive annual increase in median household income. The firs two graphs use annual averages of the Case-Shiller house price index - and the nominal median household income (and the mean for the fourth fifth income) through 2016. This graph shows the ratio of house price indexes divided by the Median Household Income through 2016 (the HPI is first multiplied by 1000). This uses the annual average National Case-Shiller index since 1976. As of 2016, house prices were above the median historical ratio - but far below the bubble peak. By these measures, we could argue house prices are 15% to 20% too high, but this is a relatively small overvaluation compared to the 50%+ overpricing at the peak of the housing bubble. The third graph shows the monthly Case-Shiller National index SA, and the monthly Case-Shiller Composite 20 index SA (through July) in real terms (adjusted for inflation using CPI less Shelter). Note: some people use other inflation measures to adjust for real prices. At first glance, this seems to suggest prices are 30% too high (and were maybe 50% to 60% too high during the bubble). However there is an upward slope to real prices, see The upward slope of Real House Prices and Lawler: On the upward trend in Real House Prices. After adjusting for the historical upward slope in real prices, I'd estimate prices are about 15% too high. On Speculation: Back in 2005, it was easy to identify excess speculation. There is currently some flipping activity, but this is more the normal type of flipping (buy, improve and then sell). Back in 2005, people were just buying homes are letting them sit vacant - and then selling without significant improvements. Classic speculation. And even more dangerous during the bubble was the excessive use of leverage (all those poor quality loans). Currently lending standards are decent, and loan quality is excellent. So prices may be a little overvalued, but there is little speculation - and I wouldn't call house prices a bubble - and I don't expect house prices to decline nationally like during the bust. The year-over-year increase in this index has been about the same for the last year (close to 6% range). Note that house prices are above the bubble peak in nominal terms, but not in real terms (adjusted for inflation). Case-Shiller for August will be released tomorrow. Texas factory activity expanded at a faster pace in October, according to business executives responding to the Texas Manufacturing Outlook Survey. The production index, a key measure of state manufacturing conditions, rose six points to 25.6 and reached its highest reading since April 2014. Other measures of current manufacturing activity also indicated a pickup in growth. The new orders index climbed six points to a 10-year high of 24.8, and the growth rate of orders index moved up to 12.3. The capacity utilization index also pushed to its highest level in a decade at 22.5. Meanwhile, the shipments index moved down several points but remained positive and at a well-above-average level of 20.9. Perceptions of broader business conditions improved in October. The general business activity index increased to 27.6, its highest reading since 2006. The company outlook index posted its 14th consecutive positive reading, holding steady at an elevated 25.8. Labor market measures suggested solid employment growth and longer workweeks this month. The employment index came in at 16.7, unchanged from September and still well above average. Less than 5 percent of firms noted net layoffs—something that has only been seen five other times since the start of the survey more than 13 years ago. The hours worked index moved down but remained positive at 13.7, indicating a continuing lengthening of workweeks. This was the last of the regional Fed surveys for October. The New York and Philly Fed surveys are averaged together (yellow, through October), and five Fed surveys are averaged (blue, through October) including New York, Philly, Richmond, Dallas and Kansas City. The Institute for Supply Management (ISM) PMI (red) is through September (right axis). Based on these regional surveys, it seems likely the ISM manufacturing index will be strong again in October (to be released Wednesday, Nov 1st). Personal income increased $66.9 billion (0.4 percent) in September according to estimates released today by the Bureau of Economic Analysis. Disposable personal income (DPI) increased $53.0 billion (0.4 percent) and personal consumption expenditures (PCE) increased $136.0 billion (1.0 percent). Real PCE increased 0.6 percent. The PCE price index increased 0.4 percent. Excluding food and energy, the PCE price index increased 0.1 percent. The September PCE price index increased 1.6 percent year-over-year and the September PCE price index, excluding food and energy, increased 1.3 percent year-over-year. The following graph shows real Personal Consumption Expenditures (PCE) through September 2017 (2009 dollars). Note that the y-axis doesn't start at zero to better show the change. The increase in personal income was at expectations, and the increase in PCE was slightly above expectations. • At 8:30 AM ET, Personal Income and Outlays for September. The consensus is for a 0.4% increase in personal income, and for a 0.9% increase in personal spending. And for the Core PCE price index to increase 0.1%. • At 10:30 AM, Dallas Fed Survey of Manufacturing Activity for October. This is the last of the regional surveys for October. From CNBC: Pre-Market Data and Bloomberg futures: S&P 500 future are down 3 and DOW futures are down 10 (fair value). Oil prices were up over the last week with WTI futures at $53.98 per barrel and Brent at $60.54 per barrel. A year ago, WTI was at $47, and Brent was at $46 - so oil prices are up solidly year-over-year. Here is a graph from Gasbuddy.com for nationwide gasoline prices. Nationally prices are at $2.45 per gallon. A year ago prices were at $2.20 per gallon - so gasoline prices are up 25 cents per gallon year-over-year. Here is the unofficial problem bank list for October 2017. Update on the Unofficial Problem Bank List for October 2017. The list declined by eight to 111 banks. Aggregate assets dropped by $1.1 billion to $26.6 billion. A year ago, the list held 173 institutions with assets of $54.9 billion. Actions were terminated against First National Bank of Griffin, Griffin, GA ($260 million); Citizens Commerce National Bank, Versailles, KY ($223 million); First National Bank of Brookfield, Brookfield, IL ($175 million); Delanco Federal Savings Bank, Delanco, NJ ($126 million); Americana Community Bank, Sleepy Eye, MN ($110 million); Gunnison Valley Bank, Gunnison, UT ($81 million); and Citizens First State Bank of Walnut, Walnut, IL ($45 million). The Farmers and Merchants State Bank of Argonia, Argonia, KS ($34 million) failed on October 13, 2017. This is the seventh bank to fail this year and the 528th bank to fail in the wake of the Great Recession. Of the 528 failures, ten have been in Kansas. The key report this week is the October employment report on Friday. Other key indicators include Case-Shiller house prices for August, the October ISM manufacturing and non-manufacturing indexes, October auto sales and the September Trade deficit. The FOMC meets on Tuesday and Wednesday, and no change to policy is expected at this meeting. Also, the announcement of the new (or hopefully reappointed) Fed Chair is expected this week. 8:30 AM: Personal Income and Outlays for September. The consensus is for a 0.4% increase in personal income, and for a 0.9% increase in personal spending. And for the Core PCE price index to increase 0.1%. 10:30 AM: Dallas Fed Survey of Manufacturing Activity for October. This is the last of the regional surveys for October. 9:00 AM ET: S&P/Case-Shiller House Price Index for August. This graph shows the nominal seasonally adjusted National Index, Composite 10 and Composite 20 indexes through the July 2017 report (the Composite 20 was started in January 2000). The consensus is for a 6.0% year-over-year increase in the Comp 20 index for August. 9:45 AM: Chicago Purchasing Managers Index for October. The consensus is for a reading of 62.0, down from 65.2 in September. 10:00 AM: the Q3 Housing Vacancies and Homeownership from the Census Bureau. 8:15 AM: The ADP Employment Report for October. This report is for private payrolls only (no government). The consensus is for 210,000 payroll jobs added in October, up from 135,000 added in September. 10:00 AM: ISM Manufacturing Index for October. The consensus is for the ISM to be at 59.5, down from 60.8 in September. The ISM manufacturing index indicated expansion in September. The PMI was at 60.8% in September, the employment index was at 60.3%, and the new orders index was at 64.6%. 10:00 AM: Construction Spending for September. The consensus is for a 0.1% increase in construction spending. All day: Light vehicle sales for October. The consensus is for light vehicle sales to be 17.5 million SAAR in October, down from 18.6 million in September (Seasonally Adjusted Annual Rate). This graph shows light vehicle sales since the BEA started keeping data in 1967. The dashed line is the September sales rate. 8:30 AM: The initial weekly unemployment claims report will be released. The consensus is for 235 thousand initial claims, up from 233 thousand the previous week. 8:30 AM: Employment Report for October. The consensus is for an increase of 323,000 non-farm payroll jobs added in October, up from the 33,000 non-farm payroll jobs lost in September. The consensus is for the unemployment rate to increase to 4.3%. In September the year-over-year change was 1.78 million jobs. This was the smallest year-over-year gain since 2012. 8:30 AM: Trade Balance report for September from the Census Bureau. This graph shows the U.S. trade deficit, with and without petroleum, through August. The blue line is the total deficit, and the black line is the petroleum deficit, and the red line is the trade deficit ex-petroleum products. The consensus is for the U.S. trade deficit to be at $43.4 billion in September from $42.4 billion in August. 10:00 AM: the ISM non-Manufacturing Index for October. The consensus is for index to decrease to 58.7 from 59.8 in September. Oil Rigs "Rig counts rebounded modestly this week"
CR Note: Oil prices increased today with WTI at $53.90 per barrel, and Brent at $60.55. If those prices hold, we might see a pick up in the rig count going forward. • The gap between Brent and WTI continues to widen, today standing at $6.60 / barrel, and both WTI and Brent were commensurately strong, with WTI adding $1.40 just today. • I think we’re likely reaching a local peak for WTI, so I expect we’ll see some retrenchment in the next few weeks somewhere, but the numbers speak to substantially stronger global oil demand than analysts currently think. The U.S. hotel industry reported positive year-over-year results in the three key performance metrics during the week of 15-21 October 2017, according to data from STR. Among the Top 25 Markets, Houston, Texas, reported the largest year-over-year increases in occupancy (+23.7% to 86.6%) and RevPAR (+25.9% to US$103.34). Post-Hurricane Harvey demand continues to drive performance levels in the market. Currently the occupancy rate, to date, is ahead of last year, and tied with the record year in 2015. The hurricanes will probably push the annual occupancy rate to a new record in 2017. Residential investment (RI) decreased at a 6.0% annual rate in Q3. Equipment investment increased at a 8.6% annual rate, and investment in non-residential structures decreased at a 5.2% annual rate. On a 3 quarter trailing average basis, RI (red) is slightly negative, equipment (green), and nonresidential structures (blue) are positive. The slight dip in RI isn't concerning - as long as it doesn't continue! Residential Investment as a percent of GDP decreased in Q3, but has generally been increasing. RI as a percent of GDP is only just above the bottom of the previous recessions - and I expect RI to continue to increase for the next couple of years. Investment in residential structures declined slightly in Q3. Real gross domestic product (GDP) increased at an annual rate of 3.0 percent in the third quarter of 2017, according to the "advance" estimate released by the Bureau of Economic Analysis. In the second quarter, real GDP increased 3.1 percent. The increase in real GDP in the third quarter reflected positive contributions from personal consumption expenditures (PCE), private inventory investment, nonresidential fixed investment, exports, and federal government spending. These increases were partly offset by negative contributions from residential fixed investment and state and local government spending. Imports, which are a subtraction in the calculation of GDP, decreased . The deceleration in real GDP growth in the third quarter primarily reflected decelerations in PCE, in nonresidential fixed investment, and in exports that were partly offset by an acceleration in private inventory investment and a downturn in imports. The advance Q3 GDP report, with 3.0% annualized growth, was slightly above expectations. Personal consumption expenditures (PCE) increased at 2.4% annualized rate in Q3, down from 3.3% in Q2. Residential investment (RI) decreased at a 6.0% pace. Equipment investment increased at a 8.6% annualized rate, and investment in non-residential structures decreased at a 5.2% pace. The final GDPNow model forecast for real GDP growth (seasonally adjusted annual rate) in the third quarter of 2017 is 2.5 percent on October 26, down from 2.7 percent on October 25. The forecast of the contribution of inventory investment to third-quarter GDP growth declined from 1.01 percentage points to 0.80 percentage points after this morning's Advance Economic Indicators report from the U.S. Census Bureau. The New York Fed Staff Nowcast stands at 1.5% for 2017:Q3 and 2.6% for 2017:Q4. the decline in inventories more than offset, lowering our 3Q GDP tracking estimate back down to 3.0% from 3.2%. • At 8:30 AM ET, Gross Domestic Product, 3rd quarter 2017 (Advance estimate). The consensus is that real GDP increased 2.5% annualized in Q3. • At 10:00 AM, University of Michigan's Consumer sentiment index (final for October). The consensus is for a reading of 101.1, unchanged from the preliminary reading 101.1. Goldman: "On Course for a December Hike"
CR Note: The FOMC meets next week, and no change to policy is expected. However it appears another rate hike is coming at the December meeting. We expect the FOMC to keep policy unchanged next week and see few substantive changes to the statement. We expect a slightly more upbeat tone on growth that acknowledges the disruptions from the hurricanes but characterizes them as temporary or in the past tense ... Despite the disappointing September CPI report, we do not expect a downgrade of the inflation assessment or outlook, reflecting broadly stable year-over-year inflation and the further decline in the unemployment rate. We expect the statement to acknowledge that balance sheet normalization was “initiated” in October, but we do not expect further discussion of the topic, given the lack of adverse market reaction and the passive nature of the run-off. We also look for the characterization of current policy (“accommodative”) to remain unchanged. The Federal Reserve Bank of Kansas City released the October Manufacturing Survey today. According to Chad Wilkerson, vice president and economist at the Federal Reserve Bank of Kansas City, the survey revealed that Tenth District manufacturing activity posted strong growth and expectations about future activity improved further. “Factory activity accelerated further in our region this month, posting its highest composite reading since 2011,” said Wilkerson. The month-over-month composite index was 23 in October, the highest since March 2011, up from 17 in September and 16 in August. The composite index is an average of the production, new orders, employment, supplier delivery time, and raw materials inventory indexes. Factory activity increased strongly at both durable and non-durable goods plants, particularly for food, plastics, computer and electronic products. Month-over-month indexes were mostly higher. The new orders index increased moderately, and the order backlog index increased to its highest reading since March 2011. The employment and new orders for exports indexes increased slightly. However, the shipments index was unchanged, and the production index eased somewhat but remained high. The finished goods inventory index jumped back into positive territory, and the raw materials inventory index also increased moderately. All of the regional Fed surveys have been strong in October. Pending home sales were unchanged in September, but activity declined on an annual basis both nationally and in all major regions, according to the National Association of Realtors®. The PHSI in the Northeast rose 1.2 percent to 94.5 in September, but is still 2.4 percent below a year ago. In the Midwest the index climbed 1.4 percent to 102.9 in September, but remains 2.5 percent lower than September 2016. Pending home sales in the South decreased 2.3 percent to an index of 115.9 in September and are now 5.0 percent below last September. The index in the West grew 1.9 percent in September to 102.7, but is 2.9 percent below a year ago. This was below expectations of a 0.5% increase for this index. Note: Contract signings usually lead sales by about 45 to 60 days, so this would usually be for closed sales in October and November. In the week ending October 21, the advance figure for seasonally adjusted initial claims was 233,000, an increase of 10,000 from the previous week's revised level. The previous week's level was revised up by 1,000 from 222,000 to 223,000. The 4-week moving average was 239,500, a decrease of 9,000 from the previous week's revised average. The previous week's average was revised up by 250 from 248,250 to 248,500. Claims taking procedures continue to be severely disrupted in Puerto Rico and the Virgin Islands as a result of power outages and infrastructure damage caused by Hurricanes Irma and Maria. The dashed line on the graph is the current 4-week average. The four-week average of weekly unemployment claims decreased to 239,500. Mortgage rates continued higher at a relatively fast pace today, pushing farther into the highest levels since early July. As of this afternoon, the average lender is right in line with those rate offerings from July. Any higher and we'd have to go back another 2 months to see comparable rates. In fact, for many lenders, the cost of offering a 30yr fixed rate of 3.875% last week now matches the cost of a 4.0% rate this week. Clients who'd seen quotes of 4.0% are now seeing 4.125%. The average is somewhere in between for top tier scenarios. • At 8:30 AM ET, The initial weekly unemployment claims report will be released. The consensus is for 235 thousand initial claims, up from 222 thousand the previous week. • At 10:00 AM, Pending Home Sales Index for September. The consensus is for a 0.5% increase in the index. The Federal Reserve Bank of Philadelphia has released the coincident indexes for the 50 states for September 2017. Over the past three months, the indexes increased in 37 states and decreased in 13, for a three-month diffusion index of 48. In the past month, the indexes increased in 38 states, decreased in 10, and remained stable in two, for a one-month diffusion index of 56. In September, 39 states had increasing activity (including minor increases). The reason for the recent sharp decrease in the number of states with increasing activity is unclear. New home sales for September were reported at 667,000 on a seasonally adjusted annual rate basis (SAAR). This was well above the consensus forecast, and the highest sales rate since October 2007. The three previous months were revised up slightly. There was clearly some rebound following hurricane Harvey. Sales in the South were up sharply from August, and at the highest level since July 2007. Some contracts in the South, that would have been signed in August, were probably delayed until September. Also some people who lost homes might have signed contracts for new homes in September (New home sales are counted when contracts are signed). Sales were up 17.0% year-over-year in September. Earlier: New Home Sales increase to 667,000 Annual Rate in September. For the first nine months of 2017, new home sales are up 8.6% compared to the same period in 2016. This was a solid year-over-year increase through September. The "distressing gap" graph shows existing home sales (left axis) and new home sales (right axis) through September 2017. This graph starts in 1994, but the relationship had been fairly steady back to the '60s. The Census Bureau reports New Home Sales in September were at a seasonally adjusted annual rate (SAAR) of 667 thousand. The previous three months combined were revised up slightly. "Sales of new single-family houses in September 2017 were at a seasonally adjusted annual rate of 667,000, according to estimates released jointly today by the U.S. Census Bureau and the Department of Housing and Urban Development. This is 18.9 percent above the revised August rate of 561,000 and is 17.0 percent above the September 2016 estimate of 570,000." The months of supply decreased in September to 5.0 months from 6.0 month in August. "The seasonally-adjusted estimate of new houses for sale at the end of September was 279,000. This represents a supply of 5.0 months at the current sales rate." In September 2017 (red column), 52 thousand new homes were sold (NSA). Last year, 44 thousand homes were sold in September. The all time high for September was 99 thousand in 2005, and the all time low for September was 24 thousand in 2011. This was well above expectations of 555,000 sales SAAR, and the previous months were revised up slightly. Some of the pickup was probably hurricane related (delayed signings). I'll have more later today. Mortgage applications decreased 4.6 percent from one week earlier, according to data from the Mortgage Bankers Association’s (MBA) Weekly Mortgage Applications Survey for the week ending October 20, 2017. The previous week’s results included an adjustment for the Columbus Day holiday. The average contract interest rate for 30-year fixed-rate mortgages with conforming loan balances ($424,100 or less) decreased to 4.14 percent from 4.16 percent, with points remaining unchanged at 0.44 (including the origination fee) for 80 percent loan-to-value ratio (LTV) loans. According to the MBA, purchase activity is up 10% year-over-year. • At 8:30 AM, Durable Goods Orders for September from the Census Bureau. The consensus is for a 1.0% increase in durable goods orders. • At 9:00 AM, FHFA House Price Index for August 2017. This was originally a GSE only repeat sales, however there is also an expanded index. • At 10:00 AM, New Home Sales for September from the Census Bureau. The consensus is for 555 thousand SAAR, down from 560 thousand in August. Freddie Mac reported that the Single-Family serious delinquency rate in September was at 0.86%, up from 0.84% in August. Freddie's rate is down from 1.02% in September 2016. This is the highest serious delinquency rate since May of this year. In the short term - over the next several months - the rate will probably increase slightly due to the hurricanes. After the hurricane bump, maybe the rate will decline another 0.2 to 0.3 percentage points or so to a cycle bottom, but this is pretty close to normal. Note: Fannie Mae will report for September soon. The automakers will report October vehicle sales on Wednesday, Nov 1st. Note: There are 25 selling days in October 2017, there were 26 selling days in October 2016. A WardsAuto forecast calls for U.S. automakers to deliver 1.31 million light vehicles in October. A daily sales rate of 52,579 units over 25 days is nearly equivalent to like-2016’s 52,584 units for 26 days. The report puts the seasonally adjusted annual rate of sales for October at 17.55 million units, behind year-ago’s 17.80 million and prior-month’s 18.48 million mark. Sales had been below 17 million SAAR for six consecutive months, until September, when sales spiked due to buying following Hurricane Harvey. Sales in October were probably also elevated due to the hurricanes. The Chemical Activity Barometer (CAB), a leading economic indicator created by the American Chemistry Council (ACC), notched an increase over September’s reading both on a three-month moving average (3MMA) basis and an unadjusted basis. The CAB was up 0.2 percent and 0.7 percent, respectively. The increases reflected a bounce back from the effects of Hurricanes Harvey and Irma. Compared to a year earlier, the CAB is up 3.0 percent on a 3MMA basis, a slower pace than the previous nine months, but one that continues to suggest further gains in U.S. business activity into 2018. CAB increased solidly in early 2017 suggesting an increase in Industrial Production. The year-over-year increase in the CAB has slowed recently, but this still suggests further gains in industrial production in 2018. Richmond Fed: "Manufacturing Activity Remained Positive in October"
Reports on Fifth District manufacturing activity remained positive in October, according to the latest survey by the Federal Reserve Bank of Richmond. The composite index dropped, affected by a notable decline in the shipments index, which fell from 22 to 9, but it remained positive across all components, indicating continued growth. While most manufacturing indexes fell in October, the wage index increased from 17 to 24, which is the highest it has been since May of 2000. Manufacturing firms remained optimistic about growth in the next six months. Most expectations indexes rose, with the exception of employment and average workweek, which both remained positive and were well above current values. This suggests decent growth in October. "Mortgage Rates Holding Recent Highs to Begin Week"
Mortgage rates were generally unchanged today despite slight improvements in underlying bond markets. As of last Friday, the average lender was quoting rates at or near the highest levels in more than 2 months, meaning today earns the same dubious distinction. The saving grace is that in relative terms, the past 2-3 months have been historically less volatile than normal, and conventional 30yr fixed rates at 4% (or just under) are still widely available for top tier scenarios. • At 10:00 AM ET, 10:00 AM: Richmond Fed Survey of Manufacturing Activity for October. Market conditions for the apartment industry remained soft in the National Multifamily Housing Council’s (NMHC) October Quarterly Survey of Apartment Market Conditions. While the Market Tightness (37), Sales Volume (45) and Equity Finance (46) Indexes remained below the breakeven level of 50 – with the Debt Financing Index (51) edging just above 50 – there was little change compared with three months earlier. The Market Tightness Index decreased from 42 to 37, marking the eighth consecutive quarter of overall declining conditions. Forty percent of respondents reported looser conditions than three months prior, compared to just 14 percent who reported tighter conditions. This is the eighth consecutive quarterly survey indicating looser conditions - it appears supply has caught up with demand - and I expect rent growth to continue to slow. 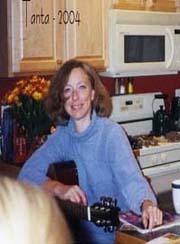 Altogether, looking at the history of the past sixty years or so, I think it is reasonable for a policymaker to conclude that while they may not yet have a perfect model to guide policy, they have a reasonable approximation to a perfect model that delivers outcomes that are generally consistent with their mandates. Moreover, are the potential gains of adopting a new framework such as, for example a nominal GDP target, worth the potential costs of abandoning the conventional wisdom? I think that is a reasonable question. In short, while many, including myself, have criticized the Fed for living in the past and continuously re-fighting the inflation wars of the 1970s, I can argue that those criticisms fail to acknowledge the improvement of outcomes since the 1970s. We argue about 50bp of inflation, for example, when the real gains were made in the first 500bp. This issue is worth considering before dismissing the validity of the conventional wisdom among monetary policymakers. They have good reasons for maintaining that wisdom. At this point, the S&P500 is up 13.3% under Mr. Trump compared to up 34.3% under Mr. Obama for the same number of market days. Chicago Fed "Index Points to a Pickup in Economic Growth in September"
Led by improvements in production-related indicators, the Chicago Fed National Activity Index (CFNAI) moved up to +0.17 in September from –0.37 in August. All four broad categories of indicators that make up the index increased from August, and three of the four categories made positive contributions to the index in September. The index’s three-month moving average, CFNAI-MA3, was unchanged at –0.16 in September. This suggests economic activity was close to the historical trend in September (using the three-month average). • At 8:30 AM ET, Chicago Fed National Activity Index for September. This is a composite index of other data. From CNBC: Pre-Market Data and Bloomberg futures: S&P 500 future are up 3 and DOW futures are up 22 (fair value). Oil prices were up over the last week with WTI futures at $52.15 per barrel and Brent at $58.01 per barrel. A year ago, WTI was at $50, and Brent was at $50 - so oil prices are up year-over-year. Here is a graph from Gasbuddy.com for nationwide gasoline prices. Nationally prices are at $2.44 per gallon. A year ago prices were at $2.22 per gallon - so gasoline prices are up 22 cents per gallon year-over-year. The U.S. hotel industry reported positive year-over-year results in the three key performance metrics during the week of 8-14 October 2017, according to data from STR. STR analysts note that U.S. performance growth was lifted due to a comparison with a Jewish holiday time period last year. Among the Top 25 Markets, Houston, Texas, reported the largest year-over-year increases in occupancy (+37.3% to 85.2%) and RevPAR (+57.0% to US$99.76). The key economic reports this week are the advance estimate of Q3 GDP, and New Home sales for September. 8:30 AM ET: Chicago Fed National Activity Index for September. This is a composite index of other data. 10:00 AM: Richmond Fed Survey of Manufacturing Activity for October. 8:30 AM: Durable Goods Orders for September from the Census Bureau. The consensus is for a 1.0% increase in durable goods orders. 9:00 AM ET: FHFA House Price Index for August 2017. This was originally a GSE only repeat sales, however there is also an expanded index. 10:00 AM ET: New Home Sales for September from the Census Bureau. This graph shows New Home Sales since 1963. The dashed line is the August sales rate. The consensus is for 555 thousand SAAR, down from 560 thousand in August. 8:30 AM: The initial weekly unemployment claims report will be released. The consensus is for 235 thousand initial claims, up from 222 thousand the previous week. 10:00 AM: Pending Home Sales Index for September. The consensus is for a 0.5% increase in the index. 8:30 AM: Gross Domestic Product, 3rd quarter 2017 (Advance estimate). The consensus is that real GDP increased 2.5% annualized in Q3. 10:00 AM: University of Michigan's Consumer sentiment index (final for October). The consensus is for a reading of 101.1, unchanged from the preliminary reading 101.1. Yellen: "A Challenging Decade and a Question for the Future"
Does this mean that it will take another Great Recession for our unconventional tools to be used again? Not necessarily. Recent studies suggest that the neutral level of the federal funds rate appears to be much lower than it was in previous decades. Indeed, most FOMC participants now assess the longer-run value of the neutral federal funds rate as only 2-3/4 percent or so, compared with around 4-1/4 percent just a few years ago. With a low neutral federal funds rate, there will typically be less scope for the FOMC to reduce short-term interest rates in response to an economic downturn, raising the possibility that we may need to resort again to enhanced forward rate guidance and asset purchases to provide needed accommodation. Oil Rigs "The US oil rig count was crushed this week"
• The loss of rigs is consistent with our lagged WTI model (below), but the scale of the decline this week was stunning. The GDPNow model forecast for real GDP growth (seasonally adjusted annual rate) in the third quarter of 2017 is 2.7 percent on October 18, unchanged from October 13. The forecast of third-quarter real residential investment growth inched down from -4.1 percent to -4.3 percent after this morning's new residential construction release from the U.S. Census Bureau. We revise up our 3Q GDP forecast to 3.0% marking to market with our tracking estimate. CR Note: The BEA is scheduled to release the advance estimate for Q3 GDP next week. Based on the August report, PCE looks sluggish in Q3 (mid-month method at 1.7%).